Easy to make and delicious, the combination of oregano, garlic, and lemon juice marks this as a Greek classic. Season the chicken halves and potatoes with salt and pepper to taste. 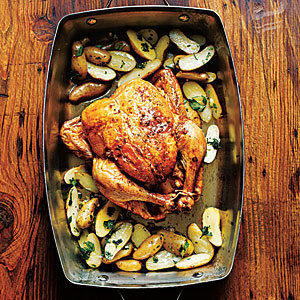 Place potatoes around chicken in a roasting or baking dish. Pour the olive oil and lemon juice over the food to coat thoroughly, and sprinkle with oregano and garlic cloves. Pour water into one corner of the pan (not on top of food). Roast uncovered at 355°F (180°C) for 50 minutes, then turn the chicken and cook 50 minutes more. Note: Check periodically during cooking to make sure there’s a little water in the pan. If it cooks down completely, add 1/4 to 1/2 cup more.